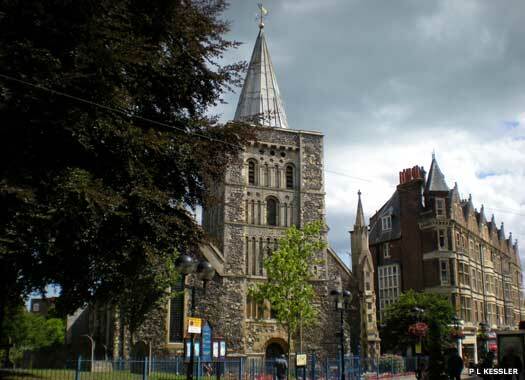 The Parish Church of St Mary the Virgin lies between Church Street and Biggin Street in the heart of Dover, near the Market Square. 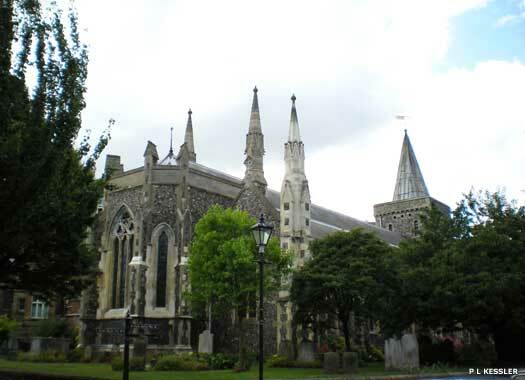 Dover's parish church was first built by the Secular Canons of Dover during the Anglo-Saxon period, on the site of Roman baths. 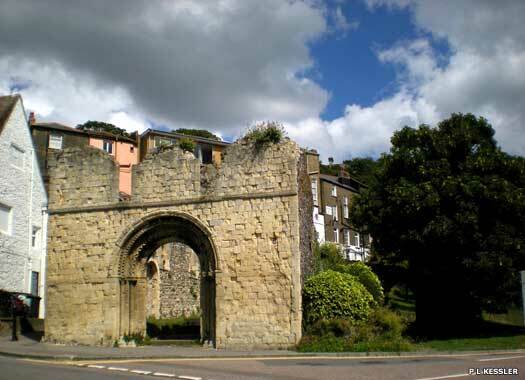 That first church was destroyed by the Normans in the Fire of Dover in 1066, and a replacement erected before 1086. 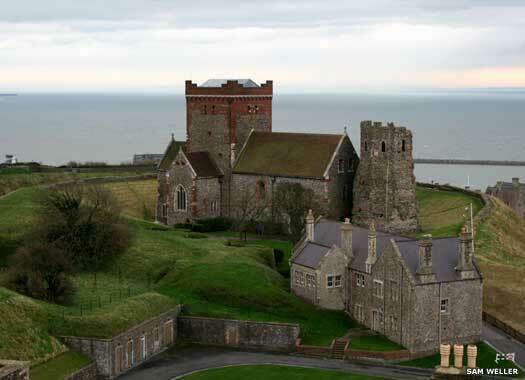 Following the Dissolution, St Mary's was given to the people of Dover by Henry VIII. At the Restoration, Vicar John Reading, along with the mayor and Corporation, met Charles II when he landed at Dover. In 1843-1844, the old medieval building was rebuilt, with the exception of the tower. The roof was raised and a clerestory added, along with the sanctuary apse at the east end, while the south aisle was widened to match the north aisle. The church suffered considerable damage in the Second World War, thanks to enemy action, but was not directly hit. St Peter's Church stood on the northern side of Market Square. 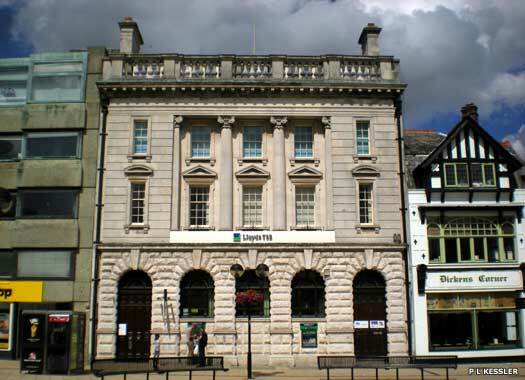 The site is now occupied by the Lloyd'sTSB Bank. Some stonework discovered during the building of the bank suggests the church was built in the eleventh century. From its tower the curfew bell was rung and many of the leading citizens of Dover were buried in the chancel, the last being in 1572. In 1581 St Peter's had so fallen into disrepair that it could no longer be used. In 1584 it was sold off and demolished. St Martin-le-Grand Church & Monastery was on the western side of Market Square. In 697 King Wihtred founded St Martin's Monastery in the Roman Saxon-Shore fort. This was destroyed by Vikings in the late 800s. The monks moved to St Mary de Castro (below), but were forced into the town in 1066. The church was started in 1070 but completed after 1140, following the monks' removal to St Martin's Priory. Later dilapidated, the old church was closed in 1539. St James (Old) Church stands on the eastern side of St James Street, just east of the junction with Woolcomber Street. 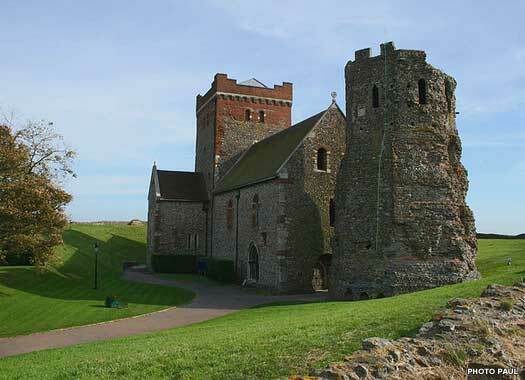 The church was built at the foot of the hill which contains Dover Castle in the Anglo-Saxon period, although much of the existing remnants date to the Norman twelfth century rebuild, which created the nave and chancel, and probably the north aisle too (the exit of which can be seen here). The south aisle (on the right, under the tree) was added later. 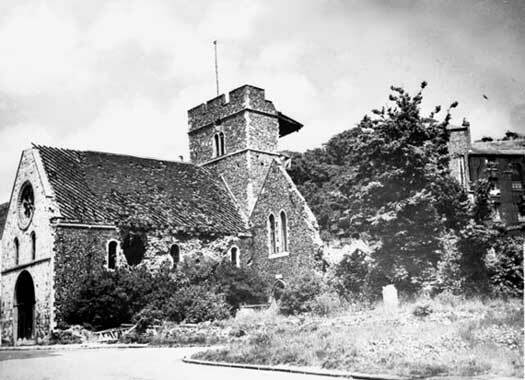 By 1860 a larger church was needed for bustling Victorian Dover and, with the opening of St James (New) Church in 1862, the old church fell into disuse for some years, until it was restored in 1869. It was destroyed during the Second World War by enemy shells fired from occupied France, and the ruins were 'tidied' in 1948 to serve as a memorial to the people of Dover who suffered between 1939 and 1945. A flagstone path now runs from the door to the old chancel. 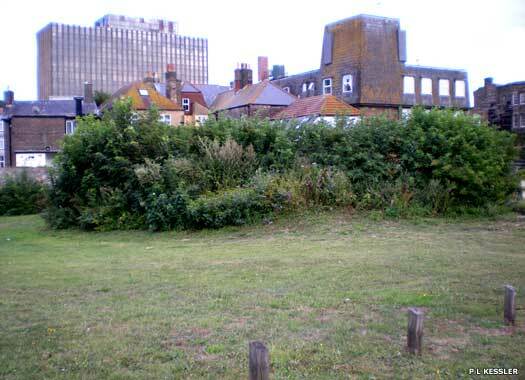 St Mary de Castro Dover Castle stands on a raised earthwork thought to date to before the Roman Conquest. The church has a claim to being one of the oldest in the country. Elements of its construction seem to have been a Roman fortress in the first century, which was converted by the British Church into a place of worship in the early fourth century. The church fell into ruin until rebuilt by Augustine about 600, shortly after he rebuilt St Martin's Church in Canterbury. St Marin's Priory moved here in the late 800s, but the monks were ejected in 1066. 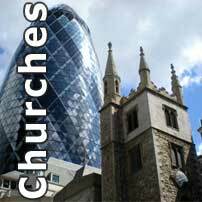 The church was ruinous by 1690, so services were discontinued. The building declined and was used from 1790 as a storehouse, barracks, and coal store, until restored by Sir Gilbert Scott in 1860. Apparently, the bells were originally hung in the Roman Pharos tower (nearest the camera), which was extended upwards for the purpose. In 1862 the Castle Garrison Church was re-opened. Queen Street Chapel stood on the corner of Queen Street and Last Lane (the lane is gone). 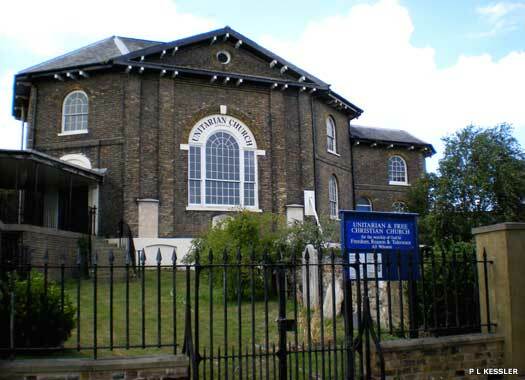 Erected as Zion Chapel in 1703, it was the first Dissenters' chapel in Dover. It was rebuilt in 1814 and from 1900 remained a mission chapel until being sold to the Baptists from the Pentside Chapel in May 1902. Closed in July 1909 it became the Queen's Hall Electric Picture Theatre (cinema), then a leather works, and finally an amusement arcade. It was demolished in October 1974. The Unitarian Church stands on the northern side of Adrian Street, with York Street bypass behind it (to the right of the photo). 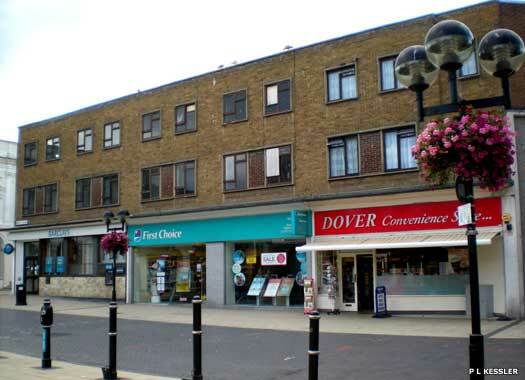 Baptists were officially active in Dover from 1643, and had a meeting house in 1655-1661. Driven from that, they met in Samuel Taverner's house in 1692-c.1750 before gaining a chapel near Market Lane. That was replaced in 1819-1820 by the present octagonal building, Dover General Baptist Church. It gained its present name much later. One photo on this page contributed by Sam Weller, and one by Photo Paul.